Join us for a crafty get-away and make 3-5 keepsake Appalachian Brooms. In addition to learning how to make the brooms, spend time in the fall forest learning how to select materials for this traditional craft. Brenda Harman is a very practical, yet whimsical person who enjoys rural life and working with her hands. A horse trainer at heart, Brenda has developed a talent for braiding, weaving and knot tying over the years. It is this experience that led her to explore Appalachian style brooms as an art form. Brenda immensely enjoys the concept of a functional unique piece of art that is both beautiful and timeless. 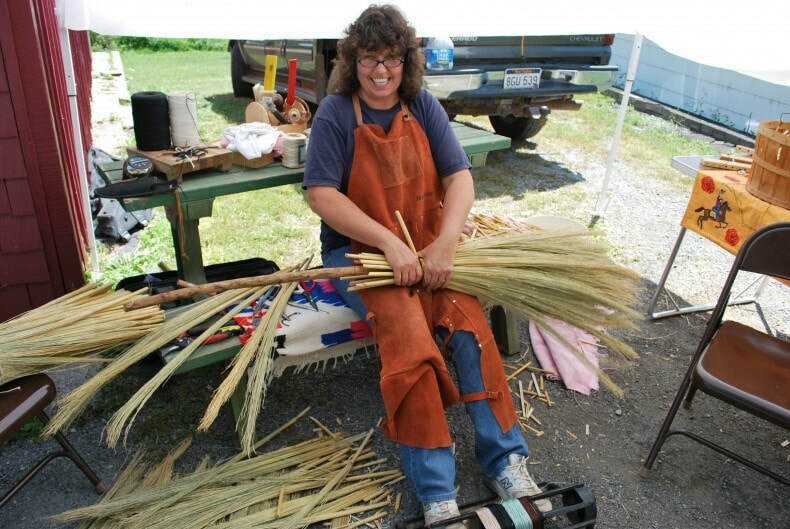 The physical work of crafting Appalachian Hand-Tied brooms soothes Brenda’s practical side, while her creative side is fulfilled by designing the various types of brooms and brushes. The unlimited number of uses for the brooms she creates is an added bonus. Brenda begins a broom by scouring the woodlands and countryside for interesting handles. The handles, mostly hard wood or deer antler, are solid and rich in character. Once selected, Brenda begins sorting the broom corn looking for the best fiber. Broom corn belongs in the sorghum family and she utilizes some home grown sorghum as visual accent pieces. Traditional means of tying and weaving creates a range of forms and designs that make up the basic shapes of her brooms. Each broom has a functional job, but Brenda can be as creative as she wants. The details are what makes each broom interesting. Brenda finishes each broom by testing its quality and durability. She does this by performing a stress test of whacking each broom against a solid object, such as a big tree. Appalachian style brooms call up memories of yesteryear for Brenda. The intricate plaiting (weaving) and sewing patterns are as varied as her artistic imagination. Working with natural materials appeases all of her senses and Brenda takes the most joy in watching Mother Nature’s gifts transform into functional works of art. All of the brooms Brenda creates blend the perfect balance of art, function, character and hard work.